A lot of people think okra is slimy and gross, I myself thought this before moving to the South. Of course, I had only had okra either deep fried or in terrible gumbos so I really had no frame of reference. One day a few years ago, I was at a potluck and someone brought this. Most of the time anything at a potluck is really mediocre, but after trying this dish I instantly became fan of okra. In a large saute pan, fry bacon until crisp. Add onion to rendered fat and cook over medium heat until onion turns golden. Add okra and season with salt and pepper. Add tomatoes and broth and deglaze pan. Bring to a boil then simmer over low heat until done, about 25 minutes. This entry was posted in Dinner, Food, Sides and tagged bacon, okra, side dishes, southern, tomatoes. Bookmark the permalink. This sounds nice. I don’t cook with a lot of okra, although I saw some beautiful red okra in the market the other day. Do you know if it has the same flavor as green okra? I simply love okra! It’s so delicious, and this dish sounds wonderful. This looks great. Funny how we can get the wrong impression when we eat the “wrong” versions of things. Keep spreading the gospel :)! Hi Greg. Doesn’t it become “ropey” after boiling? Only if you cook ones that are too large. If it’s too big it’s already stringy and bitter. I have a feeling that many Japanese think that “okra” is a Japanese word as it’s very widely available in Japan and we use it a lot in our cooking. We adapted the word from English but phonetically it sounds very Japanese. It is funny how many American words sound foreign, just so many influences in the language I suppose. I have one word for you.. BRILLIANT! When my mother sees this post today.. she is going to jump up and down lol. Why? Because my mother loves stewed okra and tomatoes. She is the master at it. I, on the other hand, never got into okra and have tried it different ways. But I’m glad you gave it a try and loved it. Classic southerners soul food dish. I’ve got to admit that the “slimy” fear is with me. Okra doesn’t appear in our markets, so I’m a stranger to “ladies’ fingers” as I remember them being called. I think we need a Southern cook. It’s sort of like squash. When Katherine’s parents cook it they cook it much longer and squash can be slimy. Same with okra. Plus the tomatoes help combat the slimy! Im not much of an okra fan but talking about adding bacon makes me like them a whole lot more! We do have tropical weather for most of the summer. This looks amazing and the more I hear about it (although I have eaten it in Indian food in the UK) the more I want to grow some next summer. And the bacon….amazing! And even if it does ever turn out a bit slimy, I don´t mind that…or am I just really odd?! I haven’t but will keep an eye out. I love tomatoes with anything. +bacon will give this texture to counteract the slimy. I do want to try this. It’s sort of like eggplant, no one is on the fence about it. Slimy and gross? I say mucilaginous and soothing. 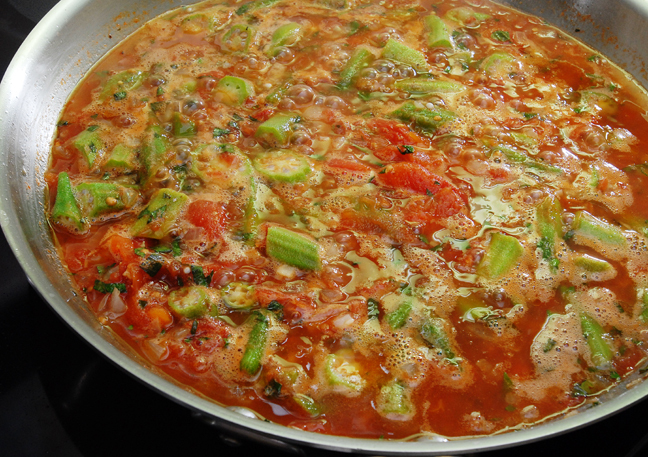 Love the combination of tomato and okra. Well, my Mom loves okra, but she particularly likes it very slimy – that prevented me from enjoying it for decades, until a couple of years ago a friend here in town made me fried okra, with a light coating of breadcrumbs and cornmeal. Of course, the healthy component of okra was pretty much gone with all the fat, but…. wow! it tasted great! Never cooked it myself, though. Ha, fried okra is later this week! Ritchey would love this! I believe I say that all the time – but he does like just about everything! But okra is a special favorite of his! My mother boiled her okra than doused it with vinegar – slimy isn’t even the word to use. I couldn’t eat it. Now your recipe – I think I could not only eat it, but like it very much! There is a phrase in the South…”everything is better with bacon” and we are certainly not strangers to the “meat than can turn a vegetarian mad” when they smell it cooking. And okra is just one of my favorites. I plan on making your very simple recipe that could turn an “okra hater” into an “okra lover”. Thanks for sharing. I think that saying was ingrained in me even before I moved South! I think I heard somewhere that Okra is only slimy when it’s not cooked with an acid…in this case, tomatoes. Probably why your dish looks darn delicious. I wish I had okra available to me so I could make this. Do you think it woudl work ok with frozen okra?? It might be too watery. It would work, so maybe just add more okra or fewer tomatoes to adjust the water. Oh man I just want to dive into that dish with a crusty loaf of bread ! Hi Greg (I’ve been calling you Rufus all along, my apologies!). There are not a lot of things I won’t eat, but unfortunately, Okra is one of them. There is nothing positive I can think of them. Sorry, I usually love your posts! The photo is gorgeous, really rich tones. No worries on both fronts. They’re just not for everyone. I hated them until I had this dish. Okra is not an easy vegetable for everyone. I love its taste (I think it’s something between green bean and asparagus) and don’t mind the sliminess. Until now I have only had it in Japanese dishes though! Your stewed okra looks fantastic! Hmm… you caught my attention in your comment that it tastes like eggplant?? really!!??? Obviously, I’ve never had okra but I’m very interested in trying it out now!! Oh no, sorry. I mean people love or hate eggplant and people love or hate okra. They don’t taste alike, sorry for the confusion. Bacon fat?? YES please. This looks and sounds amazing! I’ve actually never tried okra, but if it’s served like this, I’m all in. Bacon, tomatoes, onions, and okra…what could possibly go wrong with that?! There’s bacon in it, so I’m sure it’s great! It seems like a tasty yet simple recipe! Oh I love okra and this looks fabulous!!!! This is such a simple and wonderful recipe, my mom makes okra curry your recipe reminds me of that. You know others have mentioned how okra is common in other cuisines, so I need to branch out next year. Thanks for your kind words. Growing up in Texas, I had a lot of okra. I have to say that I really like okra; it is a great thickener for gumbo, okra and tomatoes are very good and I think the best of all…fried okra when it first comes out of a cast-iron skillet. I’m sure your recipe will entice others to give it a try. Can’t wait for the fried okra! Yum – okra is one of my favourite things to eat! Have only tried it in Asian dishes though… this sounds magic. I’ve never made stewed okra, but that looks so delicious–I’ll need to try it! I love stewed tomatoes with okra. This looks wonderful, too. I have not made this yet and hope I can scrounge up enough okra out of the garden. Oh..How I looove Okra. My mom used to make okra stewed in tomatoes very often back in Honduras! In Italy they only sell it in special markets, so I do not get to it them as often as I would like!!! I read your recipe and never thought of making a stew using Okra. I had fried and stuffed okra dish but not a stew. I have visited some Indian restaurants and gone to some of Indian weddings and they usually have fried okra. Would like to see what you come up with the fried version of it. I will be curious to try this stewed okra dish. Thanks for sharing. Your wish will be granted around 10 p.m. Thursday CST. Man that looks amazing. And yes, BACON. I really enjoy okra, but hardly ever see it for sale here. It’s not something you see a whole lot of on menus either. I was the same way when it came to okra. I make something very similar to that but I add corn to it and it is awesome, I don’t need to eat anything else with that. Thanks, and yep we love her recipe Fridays!